Drumroll…. here’s the third recipe in this year’s Zucchini Throwdown and I’m dedicating it to Roxana of A Little Bit of Everything because of her kind comment urging me to keep them coming on my previous post where I declared an end to zucchini season 🙂 Don’t get the wrong impression, just because this humble dip is third isn’t an indication of it’s overall popularity. In fact, based on ease of preparation and popularity, it should have been first! I’ve made this dip for my family at least 5 times so far this summer, it was a hit with The Young Baker and her college buddies at a recent pool party at our house, and was devoured at a recent monster graduation party that one of our close friends had for their lovely daughter. Dips are instant party food; always popular with kids and adults alike this one’s much healthier and lower in fat than the traditional heavy on the mayo and/or sour cream dips – especially if served with vegetable crudites or tortilla chips. I loved these colorful red, white, and blue tortilla chips from Trader Joes which I first bought for the 4th of July for the pool party. They still have them in some of the stores, if you like them too. I adapted this recipe from Everyday Food (January/February 2011) edition that I downloaded on my iPad, substituting goat cheese for ricotta because it’s lower in sodium and, IMHO more flavorful, and added a welcome tangy bite to the delicate flavor of zucchini. 1. Grate zucchini on the large holes of a box grater on a clean kitchen towel or paper towels. Roll up and gently press down to release liquid from the zucchini. Heat olive oil in a medium skillet over med-high heat. Add the zucchini, garlic, and thyme. Cook, stirring occasionally, until zucchini is tender and golden brown in spots, about 5 minutes. 2. Remove from heat. Let cool. Add the goat cheese, lemon zest, and lemon juice. Stir to combine. Season to taste with salt and pepper. Serve with chips, crackers, or crudites. That looks like a super tasty dip! I love garlic paired with zucchini…and that creamy texture from the goat cheese sounds fantastic! The dip looks terrific! Are those red one beet chips? Thanks, Angie! No the red ones are tortilla chips – I’ll have to check to see what they color them with. I’ll have to try this one. I have lemon thyme in my garden and goat cheese in my fridge. A zucchini should be easy to come by. Oh wow, that is a great dip! I am sure I have told you this before but I am SUCH a dip person. I could literally eat just dips for dinner all the time. This is definitely one that I am going to have to try immediately! I have everything but the goat cheese at home…think feta would work too?? Love zucchini! Great idea to use it in a dip – very unique! I love this! It is a light option for dip. I could eat dip for dinner every night. Ooh this dip sounds super yummy! I love goat cheese too. I want to sccop up a big spoonful with some pita chips. I love how you made this dip, I never tried with zucchinis and this is really must try before they are completely out! :) Great photos as always! 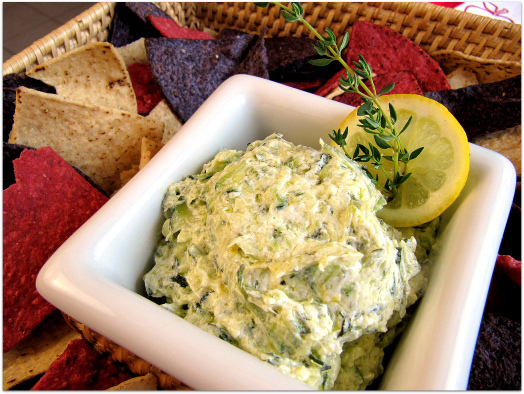 Sounds like a fantastic dip with the combination of zucchini and goat cheese, nice! Hmmm. 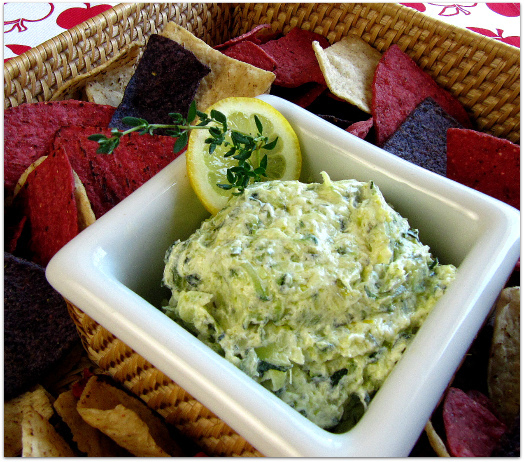 I’ve never had zucchini in this kitchen but as a dip I could sneak it in…. Way to get my wheels working! This looks great – thanks!! Thank you so much for this delicious dip and for mentioning my name. It really touched my heart. I’ve already made it and turned out amazing!!! Oh my goodness, I wish I could eat it every day. What a creamy yummy dip!! I love Trader Joe’s chips and I bet they go well with this dip! You could have done nothing better than dedicate this to Roxana, not just because of her love of zucchini, but because she’s so amazingly sweet. I love the fact that this is family-tested and approved. It looks fantastic and yes, it will get made! It’s good to meet you. I’m glad that Roxana pointed me this way. Looks delicious. Zucchini is wonderful, and I’m so happy Roxana inspired you to keep on with the amazing recipes. Great dip. Gorgeous recipe and a great way to use zucchini. I actually think that my husband would happily eat this despite his dislike for zucchini.Perfect! What a wonderful summer recipe…I would not have though of zucchini in a dip, love it! This was fantastic and can’t wait to take it to friends house to share. I came home from the farmers market with a few very large zucchini and didn’t know what to make and stumbled on the recipe and I am so glad I did. I didn’t have fresh thyme so I used 1/4 tsp. ground and I served it warm. It is my new favorite!